Okay. Things. And stuff. 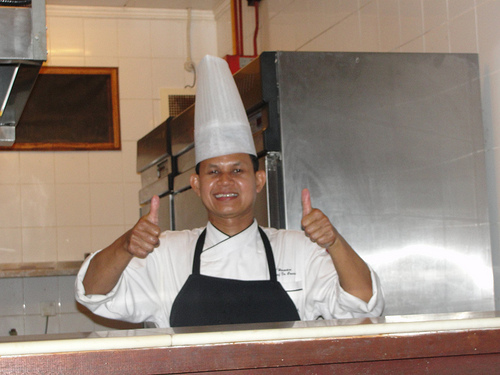 When this Malaysian chef heard the news I have for you today, his insane glee was so infectious that my daughter had to capture it on film. No lie. I’ve been ginger nutted, in the first instance. Didn’t hurt at all – in fact, it was a very pleasant experience. I should explain. To be ‘ginger nutted’ is an author euphemism for being interviewed by Jim over at the Ginger Nuts of Horror blog. He was kind enough to ask me over for a spell, make me comfortable, and pummel me with a whole range of questions. The interview covers a lot of ground. My first short stories, through Hiram Grange, Doctor Who and Iris Wildthyme, and ultimately Cuckoo (if I were to die today, Cuckoo would be my beginning and my end). Do go and have a read. Thank Jim on my behalf while you’re there. He’s a passionate devourer of horror, and an informed and interested interviewer – makes all the difference to how chatty an interviewee is going to be. Oh, there’s also an exclusive coupon there, that will snag you an ebook copy of Cuckoo for whatever platform you like (including your PC) for the grand price of 99 cents, wherever you are in the world, for another week or so. That’s the cheapest the book’s ever been, or I suspect ever will be. In other news, you can now pre-order the new Iris Wildthyme anthology Wildthyme in Purple. The book won’t be available for a couple of months, but you may as well place your order now. I can’t think of anything more Christmassy than a new Iris book. It’s somehow the perfect time of year for her. The loose theme of this collection, as exemplified by the cover below, is purple prose and pulp fiction. My entry brings back one of the forebears of modern pulp fiction, Zorro hisownself. Where Iris and Panda were forefront of my last story for Obverse Books (the still very beautiful and sluttishly available Iris: Abroad), this time I couldn’t resist letting Zorro step right up. I mean, it’s Zorro for chrissakes. What boy doesn’t love Zorro? Rest assured, there are swashes in this tale, and I buckle as many of them as I possibly can. There’s tequila as well, because that always livens up a party (and Iris is nothing without a party). It’s also the first story I’ve ever written that might just make you cheer at the end. Who could ask for more? Go and pre-order her at the bottom of this page. Cuckoo is now available as an ebook… well… almost everywhere. You can get it for the Nook, the Kindle, Apple iBooks (buggered if I can work how to link to it there though – just search “cuckoo wright” on iTunes), Smashwords, and many more (and remember, the Ginger Nuts interview has a coupon code so you can get it cheaper than anywhere else). Every one of these sites has a one click option to download a few chapters, for free. It’s the digital equivalent of flicking through a book in a book shop. Give it a whirl. The paperback is available on Amazon, and cheaper (under ten bucks, in fact) at Barnes & Noble. It’s listed in the Amazon UK store as well, but bizarrely (given that I’ve used Amazon’s print on demand technology to publish it) it’s ‘currently unavailable’. Hopefully that will change soon. So – go and buy a copy. If you did that already, read it. If you did that already, then post a quick review somewhere. Good, bad, or indifferent, customer reviews affect how a book sells, so if you’ve got to the last page, do me a favour and let people know. Finally, a reminder that you can now buy the charity anthology Kizuna in paperback and for the Kindle. Seventy-five stories, all genres, and all proceeds to Tsunami orphans in Japan. Here’s contributor Elizabeth Black talking about it at the Huffington Post. Orphans, people. Put your money where their mouths are, and check out my story ‘Sharan Gali’ while you’re there. No, really, we’re done. The ‘finally’ was a contextual clue. You can move along now. Have a good weekend and such, preferably curled up with one of the aforementioned good books.